Building Igloos - Make Time. 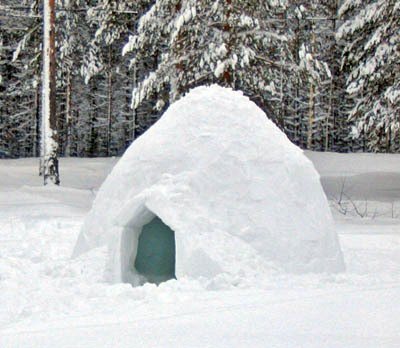 When I was fifteen or so I built an igloo in the snow. We were having Thanksgiving (or was it Christmas?) in Yakima at my aunt’s house. There was way more snow than we ever got in Aberdeen. Anyway, somehow my cousins and I got started building an igloo and even when we hadn’t finished and our hands were numb and the sun had set, I refused to give up. I stayed out in the cold and the dark to finish that igloo. I’ve hung on this memory ever since, and I’ve tended to focus on how it was an early indication of my ability to persist, to keep tirelessly pursuing a problem or project until it’s done. That’s not untrue. I am not one to give up easy. I am seeing this memory from a different angle right now, its shadowy side. You may have noticed I haven’t written a blog here since last July. the trouble really started before that. For many months now, I’ve been stuck in a rut writing-wise. As you know if you read this blog, I will do just about anything to make time to write. Even wake up at 4 AM! I don’t do this anymore, but I did for a couple of years. For a while, this allowed me to keep writing in spite of everything else that I do in a day. It worked until I reached the point where I was sitting in front of my laptop at 4:45, working on my second cup of coffee, having written three sentences and deleted nine all the while in a zombie state, my heart a cold stone. It wasn’t getting up at four that created this burn-out state. It was something else. It was the shadow side of that igloo story. I can’t pinpoint one event in my life that forced a change, but change is actually what is happening right now. It was really a culmination of circumstances that pushed me to the wall where I had to choose: fight or die? The circumstances? An ever mounting workload brought on by my own overachieving and perfectionist tendencies. More work piled on when my partner took ill and could not do much of anything for weeks. Months of random fits of sadness that brought me to tears. My own nagging resentments and unhappiness. Day after day in my plan book with nothing written under the daily log labeled WRITE. The habit I’d fallen into of numbing my pain each evening with a glass or three of red wine. Here’s the shadow side of that igloo story. I’ve struggled my entire remembered life with anxiety and imposter syndrome. I learned through childhood trauma and fifteen year in an abusive relationship to make myself small. So, it’s no wonder that I’ve spent so much of my life feeling like I had to prove my worth. It’s a vicious cycle. You feel like a fraud, so you try to do more in hopes that you might become worthy. That igloo? I was one hundred percent aware that my cousins kept checking back with me and that they had reported to the adults exactly what I was up to. There was no way I was not going to build that igloo with all of those people watching. The drive to achieve has served me well on so many occasions, but it is also the reason I found myself sitting like a zombie at my writing desk last September. And it has taken me all these months to bring myself back to life. I am only building the igloos I truly want to build. I won’t do it for approval, because I don’t want to say no, or because someone else thinks I should. I am choosing my igloos carefully from here on out. I am shedding responsibilities I never wanted right now to make room for more of what I love. I am learning to say no, to delegate, to ask for help. I am learning to say “I don’t know”. I am shedding habits that don’t serve me and I’ve been making the time to meditate daily for two weeks now. This is really helping me see all the rest of this more clearly. As for writing, what is working for me now are short bursts of hyper-focused writing. I use an app called BeFocused to time and log my writing sessions and I aim for two to six sessions per day every day. In the past two weeks, I’ve polished up four short stories and readied them for send-off, made an outline for my connected stories, and started a new story. I hope to get back to this blog more often, though it feels right to keep my posts to when I really have something meaningful to communicate about this journey we are on to live creative lives in the face of commitment, distractions, and our own self-defeating habits of mind. Also, more ironic listicles because I really like writing them. Happy New Year fellow creatives! I’m here and I’ll be checking in from time to time. In the meantime, keep choosing only the igloos you want to build. This entry was posted in A Room Of Your Own on 2019-01-14 by lizshine74. You are such an amazing woman and writer! Thank you for sharing how a creative life can take a backseat when “real” life happens. It takes courage to keep on keeping on. You’ve got what it takes, Liz.